Diamonds are everyone’s friends, especially if you can cash them out. 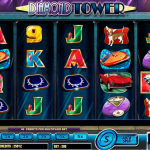 Well there are plenty of diamonds on display in the latest video slot game from Lightning Box, Diamond Tower. Follow the woman that turns into a diamond theft at night and she will lead the way. If you can help her unlock the deposit box, well only then she might share some of her finding with you. The woman is the wild in this game. Its function is to stand in for every other symbol to complete a winning line. The only symbol it cannot stand in for is the scatter and every time it helps create a win the woman will change into her thieving outfit. The diamond is the scatter symbol and it is the key to the main feature, the free spins round. You need to land at least 2 diamonds to activate the Hold ‘N’ Spin feature. This is a familiar feature where the triggering reels are frozen in place while the others will spin giving you an opportunity to land more diamonds. If you lock all the reels you will start the Break In Bonus. You will need to pick doors on each level to determine the number of free spins you get and the multiplier. 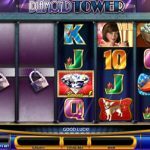 Diamond Tower is a mediocre game that we play from time to time. This title comes from Lightning Box and it may not be their best state of art game, it still has lots to offer. The design of the game might be slightly outdated but we really enjoyed the game play and the special features. This is where you can see the real potential of a game and this one can be really profitable at times we must admit. 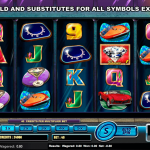 For another great engaging slot you should consider playing Blazing Goddess a 5 reel slot by Lightning Box.